In the morning you will leave the start/finish venue in groups of four or less. Signing in will start at 8am. Final instructions will be emailed to you five days prior to the event including your entry number in the order that it is received via Paypal. You will be able to form your own groups on the day and those on their own will be assisted in joining groups. Each group will be given a map and a book giving the details of each checkpoint. 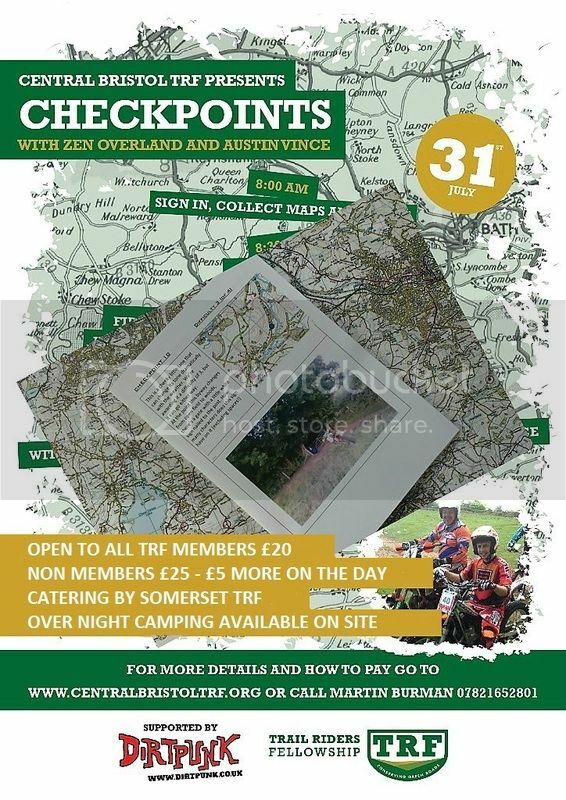 The book contains photos, a description of the exact whereabouts of the checkpoint and an OS map thumbnail. The checkpoint is a small plaque with a unique code which is to be recorded in the book. On your return you will hand back the book. The morning will be run according to the Motor Sports Association (MSA) navigational scatter guidelines - https://www.msauk.org/assets/guidetonav ... atters.pdf . There will be a total of twenty eight checkpoints. Each team will only be able to find 75% or less of the checkpoints in the allotted time, i.e. 21 or less checkpoints. Teams will be penalized for finding more than 21 of the checkpoints. 10-15 checkpoints will be a good result. From signing on to your start time is the amount of time allowed to plan your route. Groups will leave between 9am and 9.30 am at intervals in a marshalled fashion to avoid any congestion leaving the start site. Each group will have four hours to return. Groups taking longer than this will be penalized. All groups will need to return by 1.30pm. The morning’s scatter event will be scored with bonuses for finding more difficult checkpoints and those further afield. Checkpoints collected will be awarded minus points multiplied by the various bonuses which will be combined with the trials scores in the afternoon. There are no tyre restrictions but bikes must be road legal and fit for purpose. Our TRF Insurance covers you for riding on the private land in the afternoon but you MUST have your own Tax and Insurance for Highway use. In the afternoon you will be able to ride on private land around a 2.5 mile loop consisting of single track woodland, a small motocross track and some fairly steep climbs and descents - all on natural ground. Along the loop there will be five observed sections with trials style points to be lost. This is not compulsory and is merely for fun. Your individual and team scores will be recorded and added to your morning checkpoint scores. This is a fun day consisting of navigational training and observed sections to ride for confidence building. Prizes will be awarded according to a complex formula related to the teams overall score multiplied by the event organisers’ fun ratings for each team so remember it is not a race but a fun day. If you just want to ride the woods and the loop the venue will be open at 10am and will close at 4pm. Overnight camping is available but will need to be booked through Chris 07967 993050 Durley Lane BS31 2AJ. £20 for TRF Members and £25 for Non TRF Members – membership cards need to be produced on the day or the full £25 will be charged. Payment by cheque can be made to Central Bristol TRF and posted to Dave Ingle 339 Two Mile Hill Road, Kingswood, Bristol, BS15 1AN. It is important to note that your entry of £20 for TRF Members and £25 for Non TRF Members is for the use of private land. The navigational scatter is an optional extra. Last edited by ExR1 on Sun Jul 03, 2016 9:55 am, edited 2 times in total. Central Bristol TRF run event. A OS map based navigation of local Byways event with observed trials type section and hill climb.